Not to be confused with World 2-3, Level 2-3, or Stage 2-3. Area 2-3 is the third course of Jumpy Jungle and the twelfth course overall in Mario vs. Donkey Kong: Mini-Land Mayhem!. It introduces High Springs, gameplay elements that launch a Mini straight up, rather than out long. 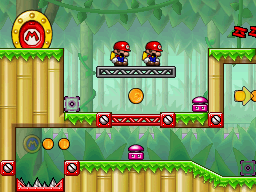 Both Mini Marios begin on a platform over to the far left on the upper level, with the exit door on the very top left. In order to reach it, they must simply be turned around and guided to a High Spring which leads directly to the exit door. The M-Token is located on the bottom left, atop a Red Girder area over a Spike Trap on the lower level. To collect it, the Mini Marios must simply remove the far left Red Girder bridge and place it over the Spike Trap instead, and lead the Mini Marios there. The Mini Mario Card is located on the right, on the middle level near the Warp Pipe entrances. The Mini Marios must be led to the upper Warp Pipe entrance, then place down a High Spring and a Red Girder bridge leading straight to it. This page was last edited on September 18, 2018, at 03:53.